A recent survey commissioned by Sustainability Victoria found that over 90 per cent of respondents believe humans are contributing to climate change and that all individuals should take action. Arguments for climate change action are compelling and urgent but too often the doom and gloom scenario leads to avoidance behaviour rather than action. We need an approach that empowers everyone to act. “Think globally, act locally” is the environmental enabling statement. It means not waiting for the Federal Government to do their job but planning and acting at community level. That’s exactly what’s happening here in the Bass Coast community. Residents at Cowes and Silverleaves concerned about severe coastal erosion have also banded together to agitate for action. The old rock wall built decades ago was never completed, and the gap focuses the wave attack and is causing severe erosion. There has been some band-aid work by Council but there is a need to fill in the “missing link” in the wall. Discussion is occurring between ministers at different levels of government and there is optimism that the State Government will consider a longer-term solution. Council has introduced environmentally sustainable design for council buildings, an excellent step that needs to be replicated across the whole community. 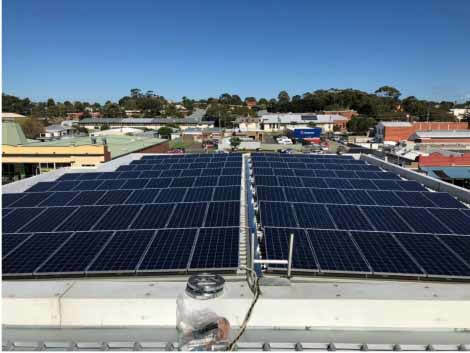 It is also retrofitting solar panels to council buildings, most recently on Wonthaggi’s Union Theatre. While we must urgently cut our emissions, more is required. Scientists are talking about the drawdown of carbon from the atmosphere. Council’s plan requires a 1.5 per cent annual increase in vegetation cover and great progress is being made through groups such as Landcare. Nearly 400,000 plants will be planted in Bass Coast in 2018, increasing the vegetation cover by 1.6 per cent. On Phillip Island soil sequestration champion Bob Davie has done excellent work on soil carbon storage. Recently Professor Tim Flannery talked about the potential role of seaweed production and deep sea sequestration. A recent program on Radio National’s Big Ideas discussed the emerging role of algae as feedstock, a replacement for plastic and fossil fuels and also to sequester carbon. Community action is heartening and vital. There is another powerful way the community can assert itself and that’s through the ballot box. The policy around climate change and renewable energy has been clouded and obstructed for 11 years by people with an interest in the fossil fuel industry holding back cleaner, cheaper renewable energy. Councils and communities can see it. They’re not waiting for the Federal Government but are already taking action – for the sake of their children and their children’s children. *Michael Whelan is a Bass Coast councillor.